The Central Bank of Nigeria (CBN) will this weekend, again, pump more dollars into the foreign exchange market in continuation of its strategy to further strengthen the value of the Naira. A source in the apex bank, said that the CBN has planned the release of an additional $350 million bringing the total to $570 million in this week alone to further crash the value of the Dollar. Already this has generated panic among currency traders who are yet to recover from the losses some of them have suffered in the last two weeks owing to sharp and sudden appreciation of the Naira. The nation’s foreign reserve hit about $29 billion as at Tuesday, last week, a position that has given comfort to the CBN Governor, Mr. Godwin Emefiele, and his team to massively intervene in the forex market. With the current position, those hoarding the hard currencies would have to quickly off-load to reduce their losses. 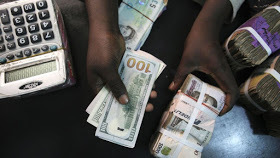 Informed sources speak of the likelihood of a liquidity glut as banks are beginning to send out salespeople to scout for customers to buy the dollar in an effort to avoid losses arising from the expected further appreciation of the naira. It will be recalled that since last Tuesday the CBN has so far supplied a total of $570 million to the market made up of $80 million for Personal Travel Allowance (PTA), Medicals and school fees, $100 million in wholesale forwards, an additional $350 million planned for injection on Friday or Saturday. Thanks , I’ve just been looking for info about this topic for ages and yours is the greatest I have found out till now. However, what in regards to the conclusion? Are you sure concerning the source? you are actually a excellent webmaster. The site loading speed is amazing. It sort of feels that you’re doing any distinctive trick. In addition, The contents are masterpiece. you’ve done a excellent process on this subject! Thanks for sharing excellent informations. Your website is very cool. I’m impressed by the details that you¡¦ve on this site. It reveals how nicely you understand this subject. Bookmarked this web page, will come back for extra articles. You, my pal, ROCK! I found just the info I already searched all over the place and simply could not come across. What a great site. I do believe all the concepts you have introduced to your post. They are very convincing and can certainly work. Still, the posts are very quick for beginners. May you please prolong them a bit from subsequent time? Thanks for the post. I really wanted to write down a simple message to express gratitude to you for all the awesome items you are writing on this website. My time consuming internet search has finally been paid with useful suggestions to exchange with my family members. I ‘d believe that many of us website visitors actually are undeniably endowed to live in a fabulous place with many brilliant people with great tips and hints. I feel rather blessed to have encountered your entire site and look forward to plenty of more brilliant moments reading here. Thanks a lot again for everything. Wow, incredible weblog format! How long have you ever been running a blog for? you made running a blog look easy. The overall glance of your web site is fantastic, as well as the content material! You actually make it seem so easy along with your presentation but I in finding this topic to be actually one thing that I think I would never understand. It kind of feels too complicated and extremely huge for me. I’m having a look forward on your subsequent put up, I will try to get the grasp of it! obviously like your website however you need to check the spelling on quite a few of your posts. Many of them are rife with spelling issues and I to find it very troublesome to tell the reality nevertheless I¡¦ll definitely come back again. Needed to compose you one very little note just to say thanks yet again for your personal spectacular secrets you have shown at this time. It’s particularly open-handed with people like you to present without restraint just what a number of us could have distributed for an ebook to end up making some dough on their own, principally since you could have tried it in case you wanted. Those principles as well worked to become a good way to realize that the rest have the same fervor really like my personal own to understand way more on the topic of this matter. I am certain there are millions of more fun sessions up front for folks who view your site. Thank you a lot for sharing this with all folks you really realize what you are speaking approximately! Bookmarked. Please also visit my site =). We will have a link alternate arrangement among us! I do agree with all of the concepts you have offered to your post. They are really convincing and can definitely work. Nonetheless, the posts are too short for starters. May you please prolong them a little from subsequent time? Thank you for the post. Thank you for sharing excellent informations. Your web site is very cool. I’m impressed by the details that you¡¦ve on this web site. It reveals how nicely you understand this subject. Bookmarked this web page, will come back for extra articles. You, my pal, ROCK! I found simply the information I already searched everywhere and just couldn’t come across. What a perfect web site. Helpful info. Lucky me I discovered your website unintentionally, and I’m stunned why this twist of fate did not took place in advance! I bookmarked it. You really make it seem so easy together with your presentation but I in finding this matter to be really one thing that I think I’d never understand. It seems too complex and extremely vast for me. I’m looking forward to your subsequent put up, I will try to get the grasp of it! I just want to mention I’m very new to weblog and honestly enjoyed this blog site. Most likely I’m want to bookmark your website . You really have good articles and reviews. Thank you for sharing with us your web-site.